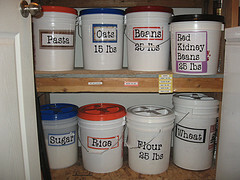 For long term food and water storage, my favorite is the 5 gallon bucket with a gamma seal lid. They are easily portable, easy to label the contents, easy to stack, easy to open and re-seal, etc! 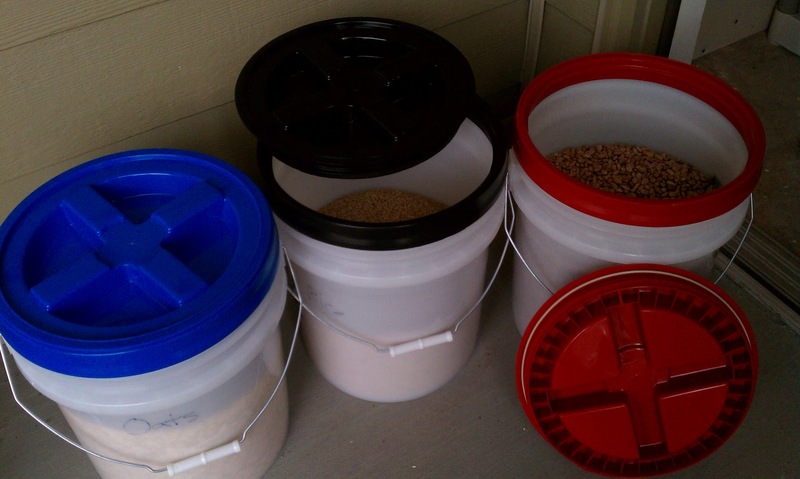 They are a great way to store food, water, and supplies. You can pick up any 5-gallon bucket from a hardware or paint store (darker in color, the better). 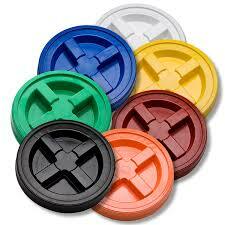 You can get Gamma Seal lids online, in surplus stores, and some hardware stores (again, darker in color, the better). Make sure they are new, have never had paint, chemicals, oils/fats, gasoline, stored in them before because those chemicals can leach back into your food/water and contaminate your stored goods. 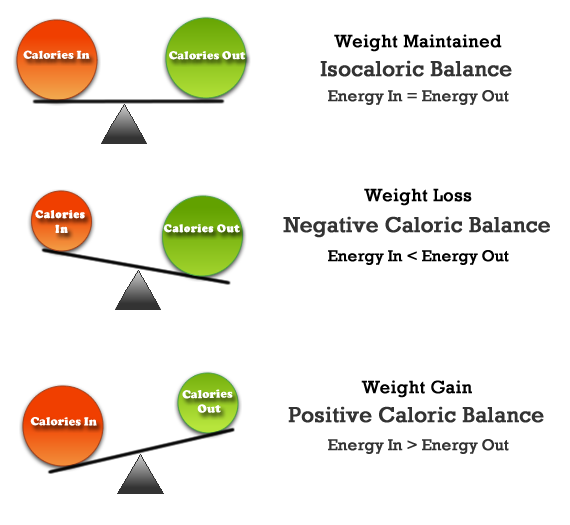 HOW MANY CALORIES DO WE BURN PER DAY? (numbers may vary depending on type of person, physical activity level, dietary needs, medical conditions, environment, etc). Scientists did a study a few years back where they took a few healthy men and women into the Sierra Nevada mountains (the same pass that the Donner Party starved to death in), and hooked them up to ECG/EKG machines and caloric meters, and had them do the same tasks the Donner Party would have had to do in a high altitude snowy environment- look for firewood, hunt for food, collect/make water, stay warm and dry. After several hours of tramping around in deep snow at the same altitude and location that the Donner Party perished at, the scientists found that their test subjects were burning close to 5,000 calories just doing basic survival skills to stay alive! And this was only 1 day of performing these tasks. The scientists concluded from these tests that most people underestimate how many calories they need in a survival situation to stay alive and be able to perform tasks that will ensure their survival- like making shelter, making fire, hunting food, getting water, etc. It is no wonder the Donner Party wasted away in a high altitude snowy freezing environment- they did not have nearly enough calories in their diet to survive..(which may have resulted in the proposed cannibalism that supposedly took place among the Donner Party). Researchers who have studied the Donner Party extensively have found that had the Party descended 600 feet in altitude down the mountain pass, they would have come across wild game, wild edible plants, running water, far less snow, and material for making proper shelters. 600 feet and they might have survived the winter! Lesson of the story- make sure you have enough calories in your Food Storage Plan to account for extreme survival situations like freezing temperatures, combat scenarios, or even common scenarios like a pregnancy. Calories mean life. Water and Food keep you alive so make sure you plan accordingly so you don’t become the Donner Party! What is the difference between all these crazy dates posted on our food and water??? SHELF LIFE- refers to the length of time a food/water product can be stored, IF properly canned, stored, and proper temperature is maintained. Example- Freeze Dried Food in a sealed #10 can stored in a cool, dark, moisture/pest free environment can last up to 25-30 years. Root crops (carrots, potatoes, turnips, beets, etc) store for very long periods of time if kept in a root cellar (somewhere cool and dark with very, very, little moisture). IDEAL STORAGE CONDITIONS- COOL (40F to 60F- temps higher than this destroy nutrients and cause spoilage), DARK (no sunlight that destroys nutrients), DRY (no moisture that causes rust and bacterial growth, and PEST FREE (no bugs or rodents). EXPIRATION DATE– by law (USDA/FDA) require only infant formula and medications to have a true expiration date. This is to prevent food-borne illnesses in infants that are incapable of fighting off a severe case of food poisoning as well as to maintain high nutrient values for those growing little bodies and brains, and because some medication will deteriorate into a dangerous chemical form past the expiration date and should not be taken. (Example- Amoxycillian antibiotics will deteriorate past its expiration date into a deadly poison). Product that has an expiration date that is not baby formula or medications/chemicals, is not regulated by the USDA/FDA and is printed by courtesy of the manufacturer of the product. BEST IF USED BY DATE- Also known as SELL BY DATE, this date is put on food and water products for several reasons. 1) The grocery store wants to move that item as quickly as possible so they can re-stock their shelves with incoming food orders. They are all about making money and selling products at their freshest insures the grocery store will make money with not a lot of waste. 2) Some foods, while they do not go “bad” (rancid/rotten), they do tend to lose a little quality or texture. Example- Lettuce or leafy greens may not be as crisp, but are still edible. Bread may be a little stale, but is not moldy. Bananas turn soft and oxidize (turn brown/black), but are perfectly edible. 4)This date is to inform the consumer when the “peak of freshness” is in relation to the product there are purchasing. Example- We know that canned beans might have a SELL BY DATE of a year, but those beans can easily last between 5 to 7 years on the shelf if the can is not dented, bloated, or rusted, and is stored properly. See above Shelf Life for Ideal Storage Conditions. STILL NOT SURE ABOUT WHETHER SOMETHING IS SAFE TO EAT JUST BY SMELLING IT, LOOKING AT IT, OR TASTING IT? 1) Rotate all your food. This is called FIFO- First In First Out. This means if you bought a half gallon of milk on Aug. 18th, and then purchased another half gallon of milk on Aug 24th, you should use up the milk bought on Aug 18th FIRST, prior to OPENING/USING the milk bought on Aug 24th. This rotation method insures you don’t use product that is extremely old (because it keeps getting put/shoved to the back of the fridge or pantry. 3) Time & Temperature Control- I could go into a lengthy section on Time & Temperature Control that restaurants use in every step of food production (prepping, cooking, cooling, storing, etc) and perhaps I will in another post at another time, but I will hit on one major point, If you have food product that is not meant for storage outside of a refrigerator (crackers, baking mixes, spices, unopened canned goods, etc are all fine sitting in your pantry) then remember to not leave it sit out of the refrigerator for more than 4 hours! When you hit the 4 hour mark, you should assume that it has been contaminated with bacteria and needs to be thrown away. Remember that Apple Pie I labeled up above? Let’s assume I take it out of the refrigerator, I cut a couple slices out of it for my family to eat. I have only 4 hours to eat those slices (and the entire pie!) or get them back in the refrigerator, otherwise at the 4 hour mark I need to throw them away because they are contaminated with possible bacteria that cause food-borne illness. Yes some folks have kept food out on the counter top longer than 4 hours and lived to tell about it, but let’s be safe for safety’s sake and stick to the 4 hour rule that the FDA and restaurants all over the country are mandated to follow. It’s just easier. The best thing to do is to follow the Expiration Date if the product is baby formula or medication; trust your eyes, nose, and tastebuds on everything else that has gone past the Best If Used By/Sell By Date; and do everything you can to extend the Shelf Life of your food (especially if you are putting the food up for long term storage ie- prepping). If the food has an off-odor, doesn’t look right (looks oily or off-color), doesn’t smell right (your nose will let you know), or has turned into a fur-bearing mammal (mold), you probably should throw it out. As for medication- NEVER throw medication down the toilet or sink!!! This contaminates our water supply and reduces the effectiveness of the water treatment at the treatment plant. Always throw meds in the trash or give to your pharmacist to dispose of properly. 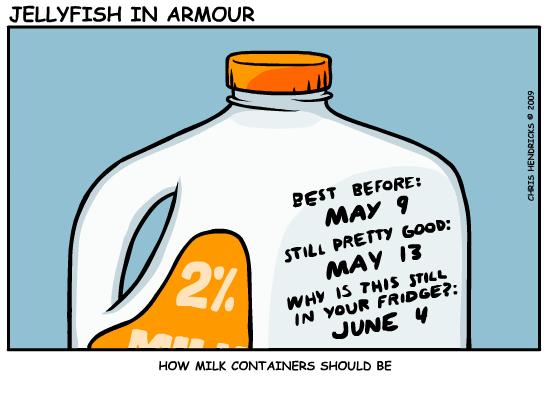 www.stilltasty.com has great references for Shelf Life of food! 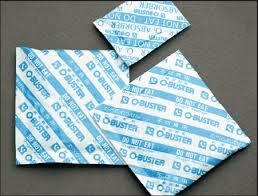 How Many Oxygen Absorbers Do I Need? *Note, these are average amounts at sea level. You may need more or less depending on your individual conditions and the remaining residual volume of air. There is no danger in adding too many as this does not affect the food.Oxygen represents 20% of the total volume of air and the number in cc’s above represents the amount of oxygen that would be absorbed. When you purchase food to lay-in or put-up, consider this order in which you will eat your food in an emergency scenario. Then rotate your foods often in the order below as well. EAT FIRST- What is in your freezer and refrigerator and what is already ‘open’ in your pantry and cabinets. Foods that will spoil without power or go stale within a week to two. EAT SECOND- Canned goods (both commercial and homemade), unopened items in your pantry and cabinets. Home sealed/canned or dried foods. Foods that will spoil within in several months to a year. EAT THIRD- Commercial purchased freeze-dried, dehydrated, and powdered long-term storage foods. Foods that have a shelf-life of 10 or more years. IF YOU DON’T USE IT, YOU WILL LOSE IT!!! Example: I take fresh broccoli from my refrigerator (or a freezer bag from the freezer), a can of pinto beans from my pantry, and a #10 Can of freeze-dried pork chops from my long-term storage. I cook dinner with these 3 items, replacing them when I go shopping the next time, and put the leftover/extra pork chops from my #10 Can sealed in a Ziploc bag and store them in the freezer. I can then use the remaining pork chops over the next month for several meals. I rotate my stock this way regularly. I date all my food with Sharpie permanent markers on the packaging- date with when I put it into storage, and then when I pulled it out of storage and opened it (if I have extra/leftovers). Use the same methods restaurants use: FIFO- First In First Out rotation to insure proper rotatation and use of your foods. No sense in letting anything spoil or go to waste since food costs money! 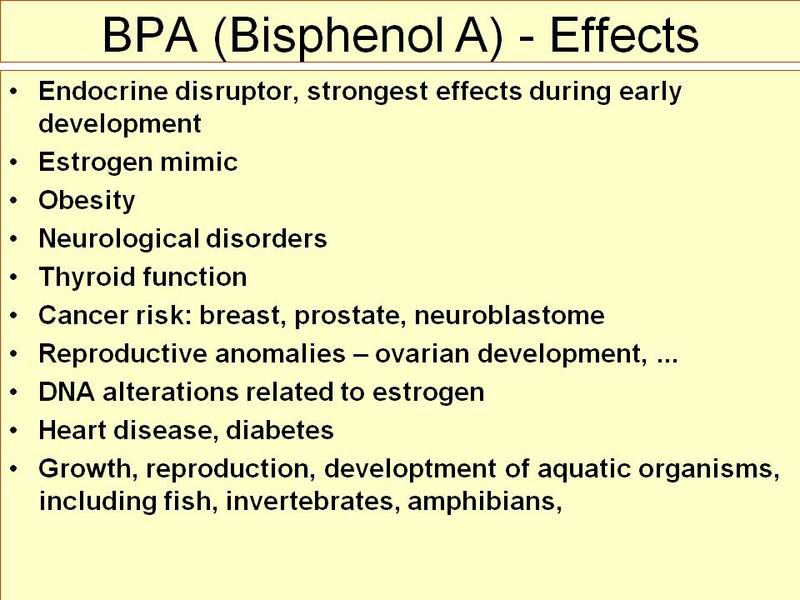 BPA stands for Bisphenol-A. BPA is an industrial chemical that has been used to make certain plastics and resins since the 1960s. Some research has shown that BPA can seep into food or beverages from containers that are made with BPA or into your body when you handle products made with BPA. BPA remains controversial, and research studies are continuing. The National Toxicology Program at the Department of Health and Human Services says it has “some concern” about the possible health effects of BPA on the brain, behavior and prostate gland of fetuses, infants and children. This level of concern is midway on its five-level scale, which ranges from serious to negligible. The Food and Drug Administration now shares this level of concern and is taking steps to reduce human exposure to BPA in the food supply by finding alternatives to BPA in food containers. Seeking out BPA-free products. This may not always be easy to do, of course. Some manufacturers label their products as BPA-free. If a product isn’t labeled, keep in mind that most aluminum cans or bottles have linings that contain BPA, while steel bottles or cans don’t. Polycarbonate plastic is generally hard, clear, lightweight plastic. It often has the No. 7 recycling symbol on the bottom. Cut back on cans. Reduce your use of canned foods since many cans are lined with BPA-containing resin. 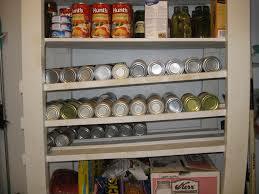 Or store canned foods in cool, dry, dark places to minimize heat fluctuation.